Juicy red strawberries with a kiss of dark coca -this black tea is all about you. Bursting with luxurious flavor, it’s decadence dipped in excess with a side of unbridled joy. All natural premium ingredients: Full-leaf black tea, strawberry pieces, cacao nibs, strawberry leaf, chocolate and strawberry flavors. I tried this tea back in December, but I held off on publishing the review until just before Valentines Day, because when I think of chocolate and strawberries, I think of Valentine’s Day. The fragrance of the tea that sits before me is delicious – it is making my mouth water! I can smell notes of chocolate and strawberry, as well as a very pleasant-smelling black tea. The combination of these scents is fantastic. The black tea base tastes like a Ceylon tea to me, it has a brisk flavor but a fairly even-toned taste to it. It has a smooth, clean taste with a light astringency that lightly dries the palate in the finish. The strawberry flavor hits strongest in the aftertaste. I can taste the strawberry throughout the sip, but it is in the aftertaste where I taste the sweet yet tart tingle that is very strawberry-esque. It reminds me of a fresh, delicious strawberry. This is a tea that should be served hot… but, should not be consumed until it has had a few moments to cool. The slight cooling will allow the flavors to develop a little bit, and I found that this tea was much more satisfying when it was still hot, but not directly-from-the-teapot-hot. The chocolate flavor is the reason I mention this about allowing the tea to cool slightly… I find that when the tea is still piping hot, the chocolate flavor seems almost… absent. But, as it cools a little (I’d say its now an easily sip-able temperature. That is, it is not so hot that it scalds my tongue) the chocolate flavor develops nicely. Overall, this is a very pleasant cuppa. I would probably find it even more satisfying with a little more chocolate, but then, I’m a chocoholic, and I’m of the belief that more chocolate is always better. As it is, though, it’s quite delicious. All natural premium ingredients: Full leaf Japanese Sencha green tea, hibiscus, grapefruit peel, pineapple pieces, calendula petals, lemon and natural grapefruit flavor. When I first approached this tea, I didn’t have high expectations. To be honest, I was like, “Oh, another citrus tea.” But this tea blows me away! It is really delicious. The flavor of the Japanese Sencha is gentle and unassuming, with a pleasing buttery backnote. Not grassy, not vegetative, just soft and fresh-tasting tea. The green tea base allows the flavors of this tea to become the main focus while still maintaining its presence in the cup. There is such a unique and delicious combination of flavors. All at once, I can taste the flavors of grapefruit, lemon and pineapple swirling on my palate. I can taste the hibiscus, but it is so very gentle that if I were not focusing intently on trying to pinpoint the various flavor notes, I think I probably would miss the hibiscus. Probably the place where the hibiscus is most prominent would be in the color of the tea – because it brewed up to a pretty – albeit unusual – pink-ish green color. I think what I like best about this particular tea is the grapefruit! For those of you familiar with my tea reviews in the past, you know about how I’ve been searching for the ideal grapefruit green tea, and even though this one has other flavors in it, I do believe I have FOUND my grapefruit green! I think it is the presence of these other flavors that makes the grapefruit flavor so incredibly delicious for me. This is THE BEST grapefruit green tea that I’ve tasted, and I think that may even go for the grapefruit green tea that started me on this quest! This is YUM! South African rooibos with orange peel and vanilla creme. This is really quite good… much better than I was expecting! The dry leaf smells very orange – vibrantly orange! There isn’t a lot of “cream” scent or vanilla scent to the dry leaf aroma, and even less when the tea is brewed. But, the orange smells so sunny and delicious, that I’m finding it difficult to find fault with the lack of vanilla fragrance. The flavor offers a good balance between sweet and tart. I really thought that this would end up too sweet, what with the sweet flavors of orange and vanilla, not to mention the natural sweetness of the rooibos. Then I read the ingredient list for this tisane, and I realized why it’s well balanced – the hibiscus! In this instance, I think that hibiscus is a smart addition. I mean, I am a sweet tooth and I therefore have a great appreciation for things that are sweet, but, sometimes… it can be too sweet. And that was my worry for this blend. But thanks to the hibiscus, it isn’t. And thankfully, the hibiscus is not overdone in this blend. It offers just the right amount of tartness to the blend while adding a palate-pleasing body to the cup, but the flavor is NOT hibiscus. Nor is the tea thick or syrupy. Just right! The combination of the orange and the vanilla creme give this a creamsicle kind of taste. If I were to change anything about this particular blend, I would want the vanilla flavor to be a bit stronger, mostly because I’m really digging the way the creamy taste accents this blend. The rooibos taste is light and nutty with faint wood notes. The flavor of the rooibos is significantly softer than that of the orange and the vanilla, but, I like it just fine like that. This caffeine free blend would make a great treat any time of the day, and it’s bright, sweet taste is sure to be a hit with kids as well as adults. It’s easy to see why Talbott Teas are one of Oprah’s Favorite Things – this is fabulous! Our top 4 luxury blends are now available in sachets. Just drop one in your cup, and you’re good to go. 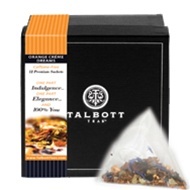 Plus, Talbott Teas sachets are made of eco-friendly Soilon, which is 100% biodegradable. One of the first things I tried from Talbott Teas was their Sachets. I received one of their Premium Gourmet Tea Sachets Sets – more specifically their Orange Creme Dreams Sachet Set. We should have an Orange Creme Dreams tea review coming up within the next few weeks so stay tuned for that! In the meantime, I would love to show you this set! What’s neat about this set from Talbott Teas is that you can choose from their top sellers and they only cost $12! That AND they are eco-friendly! That’s always a PLUS! Again, I really love how simple yet stylish these gift boxes are! And when you open it up it smells heavenly! You close your eyes and let the heavenly aroma of real orange peel and vanilla carry you away. In this dream, you can be anyone. But you choose to be you. And as a teaser for the Orange Creme Dreams, specifically – check out these ingredients: All natural premium ingredients: rooibos, orange peels, apple pieces, rosehips, hibiscus, calendula petals, safflowers, natural orange and vanilla flavors. Just another look at why I think Talbott Teas made the Oprah’s Favorite Things list this past week! 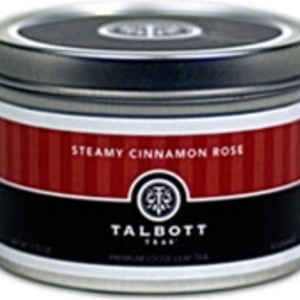 Quality, Style, Taste, Fun, and Great Customer Service…Talbott Teas! Surprise the sophisticated tea connoisseur in your life with a delightful gourmet tea gift set. Whether you’re looking for a unique housewarming gift or a thoughtful birthday present, our gourmet tea set will please even the most selective of your friends. Our Indulgence Gift Box is beautifully packaged and contains 1 full-sized tin of blended loose leaf gourmet tea, 6 honey straws, 1 tea filter wallet, and a stainless steel gourmet tea scoop. Sleek black keepsake gift box with one tins of gourmet tea, tea filters, and the “perfect cup of tea” spoon. Continuing our celebration of TEA being highlighted on Oprah’s Favorite Things this past week – I decided to share one of the gift sets I received a while back available for only $25 at Talbott Teas! It’s the Indulgence Premium Gourmet Tea Gift Set and I just LOVE it! The first reason I adore this gift set option is because you can choose which one of the 14 Talbott Teas you include in your gift set. Another reason I like it is because of the simple yet attractive box it comes in. You also get 6 honey straws, 1 tea filter wallet, and a stainless steel gourmet tea scoop in this gift set from Talbott Teas! All of this for just $25. Any tea lover would be thankful to receive this as a gift this holiday season or any time of the year! With that in mind I would like to say Happy Thanksgiving to all who celebrate! 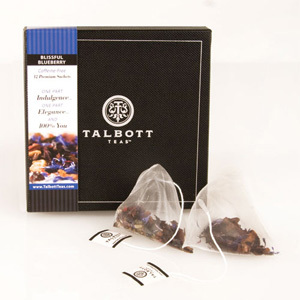 Another Talbott Tea Review that was posted on SororiTEA Sisters this week was the Blissful Blueberry and since the holiday season is officially here – this being Thanksgiving and all – I thought I would share an idea I saw on the Talbott Teas Website! TeaTini’s! 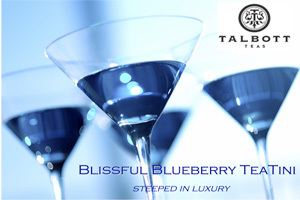 Vodka infused with Talbott Teas. It is truly one of the most delicious cocktails. SororiTEA Sisters wish you a very safe and happy holiday season!